Citroen XM – Winter driving – HubNut – celebrating the average! Winter can be a time to fall out with a car. I used to get very seriously fed up with Citroen BXs, because the doors always seem to freeze shut, and I once had the lock mechanism freeze up sufficiently to stop the door closing once I finally got it open! The heater fans were never much cop either, and the single wiper a constant source of annoyance. Winter is very much here now and so far, the XM is doing itself proud. This morning, there was a particularly severe frost. Remote central locking unlocked the car nice and easily, and the door opened without problem. I started the car and put the heater on. Tip: while I set it to maximum heat, I only selected a gentle fan speed. Too fast and the engine, especially a diesel, will struggle to warm up at all. I left it running and returned to my breakfast. Within a few minutes, the car was ice-free, fully demisted and ready to go. It was a pleasure once out on the road too, and I became grateful for the ContiWinterContact TS850 tyres it now wears. I will be giving them a thorough test in the coming weeks. Especially if we get some snow. One concern I do have is about the windscreen washer bottle. I’ve strengthened the mixture, but the fluid can still freeze. Given that the washer bottle is tucked away in the wheelarch, there’s not much chance that engine heat will thaw it out. As the wipers come on with the washers, this could be a frustration I haven’t yet discovered! In the 2CV, the manual pump freezes up, so that’s my first clue that all is not well. The bottle sits right above the engine, with a heater tube wrapped around it. It de-ices quite nicely. 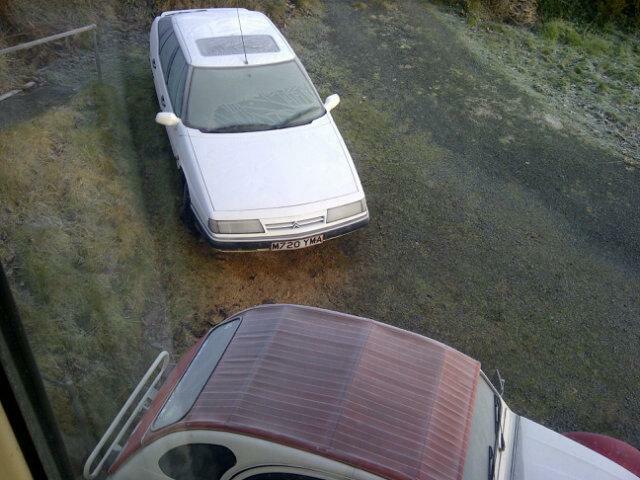 Mind you, as I discovered three times yesterday, the 2CV itself does not de-ice anywhere near as swiftly as the BX! Swings and roundabouts. Reminds me of when I had a DS23 Safari,whose rear door locks froze up so I had to hold the doors closed by attaching a rubber bungee luggage strap to the interior door handles stretched across the rear seating department, the doors still flapped a bit ! I’ve seen washer bottle heater kits to stop freezing. Popular in scandinavian countries. Another way around the washer fluid freeze problem is to remove nearside front splashguard and fit some fibreglass loft insulation around the bottle and zip tie it on to insulate it from cold air/windchill effect. Or you could retro fit a heater element and controller from any car that has heated washer bottle. Citroen did deliver XM and Xantia in Scandinavia with heated windscreen washer system, the tubes and windscreen muzzles contain heating components. Although, we do use washer fluid made for -15 Celsius or less if needed.